Theres’a shortage of pork in our country right now. Prices are increasing due to high demand but less supply. Basic law of economics. For consumers, it’s not a good news. Most specially since most Filipinos are pork lover. While this is a bad news for most, this is a good news for hog growers. 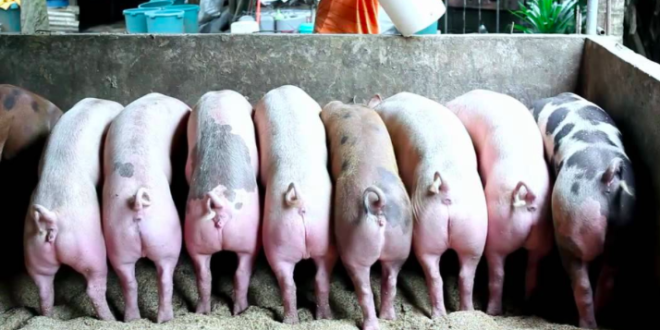 Raise more hog and earn more money. This is a lucrative agri venture since average hogs are raised for 4 months only to be ready for meat. Growing a pig for meat can take up to 4 months. 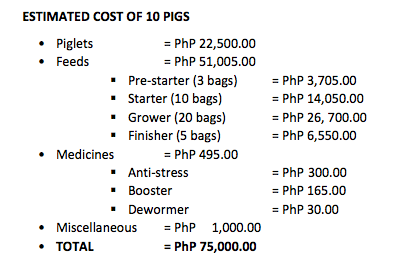 It costs around PHP 75K from start up to the 4th month, where the pigs are ready for the market. This cycle can yield around 20% profit. If you can find ways to make it even more profitable, good for you. I grew up in a small barangay where people raise hog in their backyard. On harvest, they will offer the meat for consumption of people living nearby. It’s a sure hit because it’s fresh and the price is lower than the market price. It’s impossible to do hands on on hog growing if you are an OFW like me. The only way to do that is to find someone who can do it you. Our first option is our family member or people we knew. While this is a good way to give them extra income and grow your money, most OFW’s end up losing both the capital and profit. This is a sad reality. So how did we do it in TGFI Singapore? We found a reliable partner on the ground to help us look for partner community and hog raiser to raise pigs for us. It’s a win win solution for all parties. Unlike hog growing with your family members, dealing with those you are not related to have much advantage. There’s much accountability involve and you can deal with them for any wrongdoings. There are lots of them in the provinces, just waiting for financial support and guidance to start backyard hog growing business. We start by letting them raise 10 hogs for start. Depending on their performance and capacity, we can add along the way. A good partner on the ground is the main key for this venture to succeed. He will be the one in charge to find partner farmer, educate them on proper hog raising technique, sourcing for good breed of piglets up to selling the pigs every 4 months. Right now our partner community is in the area of Laguna. We are targeting around 600 heads for this year and possible expansion to other province in years to come. All investment have risk and the only way to minimise it is by knowing what you are doing. Count your profits but always anticipate losses. Previous: Insurance for Diabetes: Here’s the ONLY policy you can get!